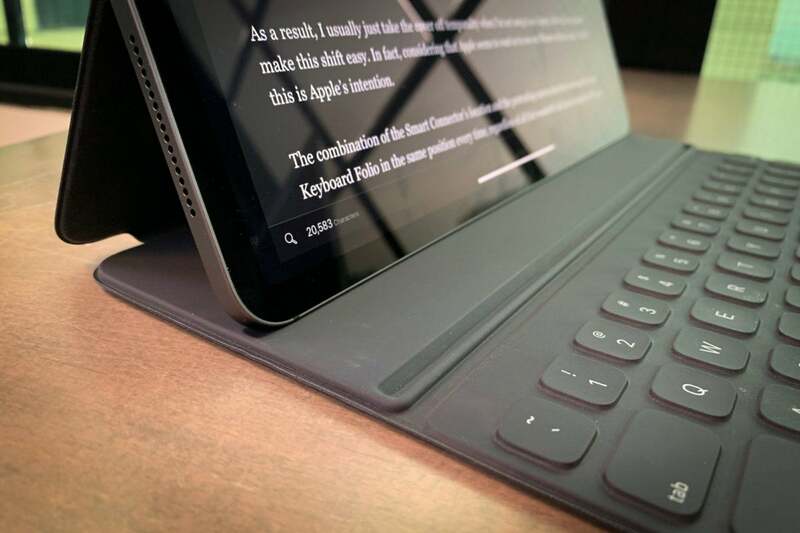 We’ve been looking at how to use an iPad Pro to replace a laptop for many tasks. In this chapter, we share several tips to help you be more productive with your Apple tablet. Method one: Tap and hold anywhere on the keyboard with two fingers; the keyboard will grey out and become a giant touchpad you can use to place your cursor at the relevant point in the text. Method two: Tap and hold one finger on the Space bar for the same effect. You can also select text. For example, use method two to position your cursor and then use a second finger to tap the screen. The text selection tool will appear under the cursor, and you can then move the cursor to select characters, words, sentences, or paragraphs. Once you select text, you can replace it or tap the selected area once to reveal the contextual menu where you can access other functions, such as applying Bold or Italics to your copy. Remember the four-finger inward pinch gesture to return to the Home screen from within any app? Tap and hold one finger almost anywhere on the display, and swipe down a short distance — search will open, along with an on-screen keyboard you can use to find what you need. Or tap the microphone button you see there to dictate your search. It takes around 15 minutes to become fully focused on a task once you are interrupted, which is why it makes sense to take control of Notifications on iPad. iOS 12 lets you use the Do Not Disturb function to block all incoming calls and Notifications for different durations: Open Control Center and tap and hold the crescent moon (Do Not Disturb) button. You will then be able to silence calls and Notifications for any of a range of durations. If you want to receive calls but not notifications while in this mode, you can enable calls from some or all of your contacts in Settings>Do Not Disturb>Allow Calls From. You should minimize all such interruptions in normal use by opening Settings>Notifications and turning off notifications for apps you don’t really need to know about urgently, particularly apps that like to use this feature just to remind you they are there. The Dock on an iPad can hold so many apps (it varies by model, but 15 is a good ballpark number). Favorites are to the left, with recently used and suggested apps to the right. If you are using the tablet’s multitasking features, you can boost productivity by placing your most-used apps in the Dock. Tap and hold an app icon until a cross appears to the top left and it begins to wriggle, then drag that app into the Dock. Repeat this step until you have all the apps you need stored there. When you have finished, tap the Home button or tap Done in the top right corner on Face ID iPads. Once you do this, your most frequently used apps will always be available from within your Dock, which makes them much easier to access in Slide Over or Split View. You can also create folders. Tap and hold an icon, and place it on top of another to next both apps inside the folder, repeat until you have a logical collection in place: Image Editing, Productivity, or Team Management apps, for example. The great thing about folders is that you can also add these to the Dock in exactly the same way as described above. Once you have created a logical collection of apps, you can then easily access them from the Dock, which makes multitasking much, much easier, as the apps you need will always be there. You can save Safari pages as mini-apps that exist as icons on your iPad just by using the "Add to Home Screen" item in the Share pane from the page. This can be useful to access some of your enterprise services using your browser directly from a folder in the Dock. Just create the icons, and pop them inside a folder. I find this a lot more convenient to simply access these web services in Slide Over while working in Word, for example. The Share menu is customizable: Tap it from within any app, scroll right in the app sharing or functions menu, and you’ll find the More… button. Tap this, and you’ll be able to add, reposition, and remove all the available Share options on your system, including shortcuts and those from third-party apps. This is a brilliant way to make sure the share options you really need are available and quick to get to without too much scrolling action. To add attachments to a Mail message, just tap in an empty part of the message you are writing, and the contextual toolbar will appear. Choose Add Attachment to place items from Files (which will be held in iCloud, Dropbox or any other storage service) or Insert Photo or Video to place an image or video from Photos. It’s smart to assign VIP status to key people, such as family, friends, and colleagues, because doing so makes it much easier to track messages from them. I use this in combination with Mail notifications — the only emails I am alerted to are messages from my VIPs. To assign the status to a contact on an iPad while in Mail, just tap the Sender address and then choose Add to VIP in the next pane. It’s annoying when you are working on your iPad and it locks, so why not change the Auto-Lock status? Open Settings>Display & Brightness and set it to five minutes, which should give you time to think while you use your iPad to create your project plan. I’d advise setting this back to two minutes once you’ve finished your work or if you are in a public space. Security means paying attention to such things. Notification Centre widgets can be a useful way to track appointments, directions, access Siri Shortcuts, Notes, weather data, and all the other mini-apps your iPad Pro supports. The thing is, without a little attention, your widget collection will get longer, making the ones you use most often harder to find. To fix this, scroll all the way to the bottom of the widgets page and tap Edit. You will then be able to change the order in which widgets appear by moving the "hamburger" button to the right of the name, remove widgets you don’t use, or add new widgets you’ve not begun using yet. I usually keep Calendar, Notes, and Siri App Suggestions at the top of the list. When your iPad is connected to a keyboard, you can wake it up by tapping the Space Bar. When working in multiple apps, swipe the Home bar at the bottom of the display left or right to very quickly move between apps. You can also use four-finger swipe left/right anywhere on the screen for the same effect — both of these are really simple actions to take when working with your iPad and a keyboard. I’ll let you know when I publish the next article in this series: Please follow me on Twitter, and join me in the AppleHolic’s bar & grill and Apple Discussions groups on MeWe.